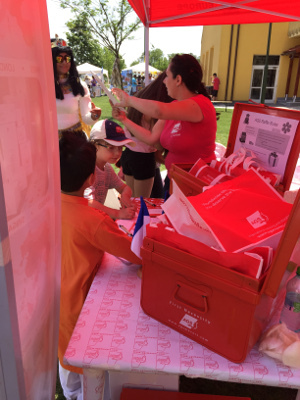 AGS Bucharest participated in the recent International Festival hosted by the American International School of Bucharest – an event which attracted over 1 000 visitors! 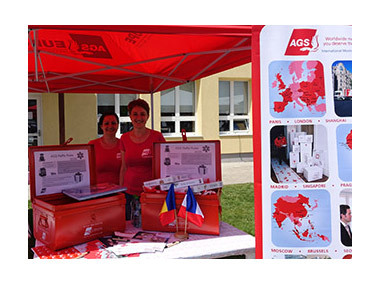 AGS branches take pleasure in engaging with their local communities around the world, and our Bucharest branch has shared news of two uplifting activities it has been involved with in Romania. AGS Movers Bucharest participated in the recent International Festival hosted by the American International School of Bucharest – an event which attracted over 1 000 visitors! AGS staff guided students on a virtual tour of the world between AGS branches. “The little travelers of today will be our colleagues or clients of tomorrow!” says Branch Manager Gratiela Lascu. The international festival saw students, parents, family, and friends coming together to showcase traditional costumes, dishes, music, art and games. At AGS Bucharest’s booth, students were introduced to Fred – the AGS moving man – and the most active students were awarded with Lego games with Romanian highlights and atlases. On the very next day, AGS Movers Bucharest was again active in another event they had sponsored: the ‘City of Joy’ cultural tour, celebrating the troubled life of George Enescu (a famous Romanian composer and musician). AGS Movers Bucharest’s staff spent a pleasant morning in the company of expats of all ages, discovering hidden gems related to Enescu and hearing interesting stories from a Cultural History expert.